The Pastures was designed by Charles Voysey and is now listed Grade II*. 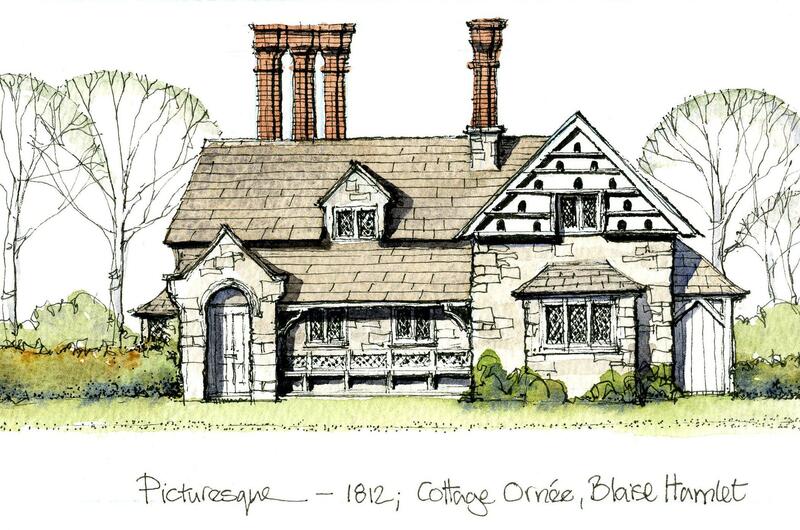 Voysey was not a very prolific architect and almost all his commissions were completed between 1890 and 1914. 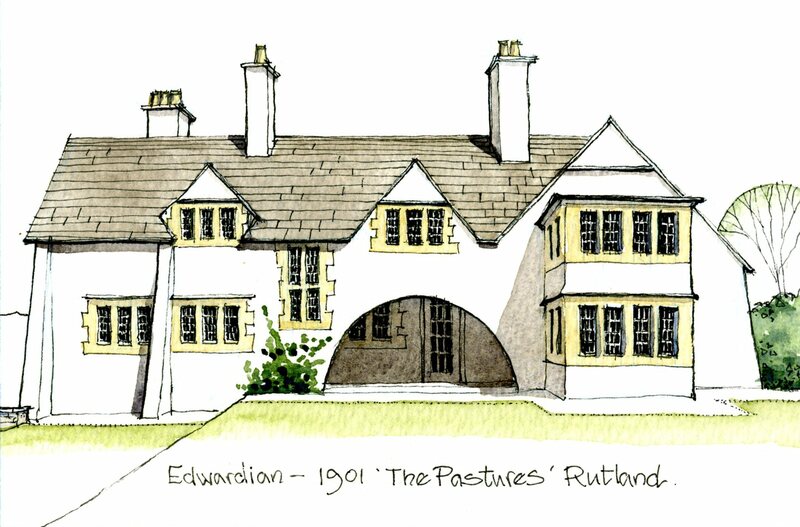 These mainly comprised a series of individual houses in locations across England; all in his trademark style of simple rendered walls with horizontal ranges of windows set in stone surrounds and subdivided by stone mullions, under roofs of slate or stone flags, with deep, overhanging eaves. 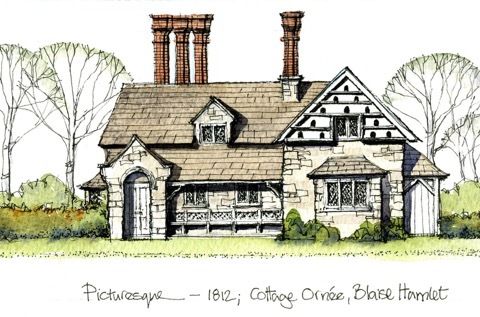 Whilst Voysey only completed a relatively small number of buildings, his work was widely published and influenced a generation of architects, including those responsible for the garden cities of Letchworth and Welwyn built in the early decades of the 20th century. Tombleson Associates are not only Members of the Royal Institution of Chartered Surveyors, but also hold high academic qualifications in field of Historic Building Conservation. 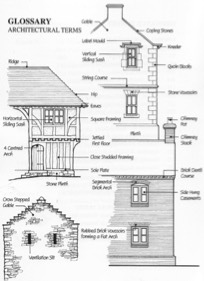 Please Contact Us Today and we will be happy to discuss all your Historic Building matters entirely without obligation. 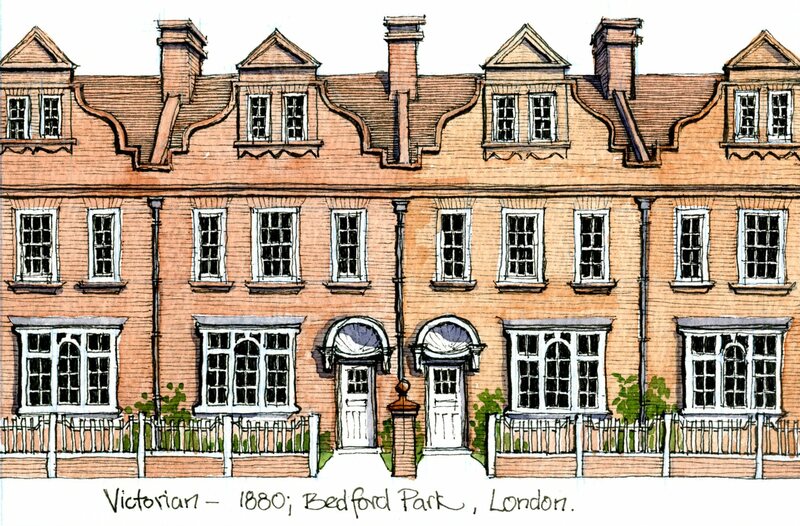 Bedford Park is regarded as the prototype for later garden suburbs and was conceived by Jonathan Carr, who in 1875 bought 24 acres of land adjacent to the newly built Turnham Green station 30 minutes from the City. 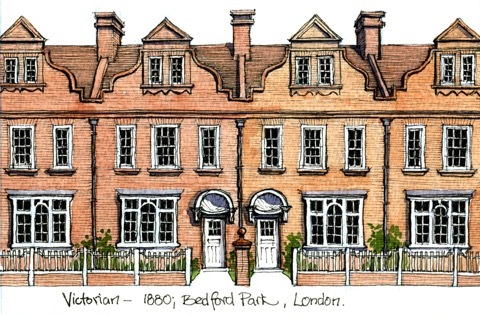 The well regarded Victorian architect Richard Norman Shaw was responsible for a number of house types at Bedford Park, and was succeeded by his pupil and protégé Edward J May. In 1880 May designed this terrace of four houses with their distinctive Dutch gables and shell-shaped porches. The terrace is today listed Grade II and Bedford Park is designated as a Conservation Area. Expert surveyors at Tombleson Associates are not only Members of the Royal Institution of Chartered Surveyors, but also hold high academic qualifications in the field of Historic Building Conservation. We regularly examine and survey Victorain Buildings like Bedford Park in Hampshire, New Forest, Isle of Wight, West Sussex and Dorset. 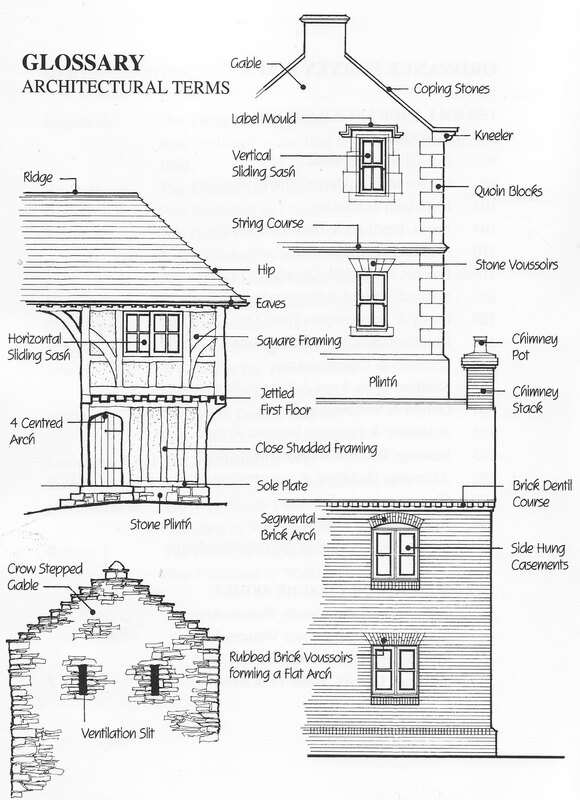 Please Contact Us Today and we will be happy to discuss your Historic Building matters entirely without obligation. The Picturesque Movement began in the latter part of the 18th century, and originally applied to landscape painting. By the Regency Period the term was applied to cottage ornée - deliberately contrived rustic cottages - and to Italianate or castellated country houses. Blaise Hamlet was commissioned by the Quaker banker John Scandrett Harford to house his retired servants and is the work of John Nash and George Repton (son of Humphrey Repton). The hamlet consists of 9 differing cottages informally arranged around a central green. The cottages are built of stone; with roofs of stone flags, thatch or plain tiles and all have elaborate brick chimney stacks. All 9 are listed Grade I. 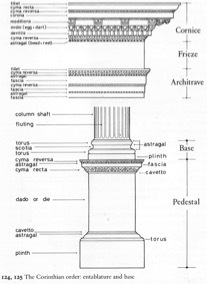 Above image will help to explain the basic Glossary of Architectural Terms. Contact Us Today and we will be happy to discuss all your property matters. 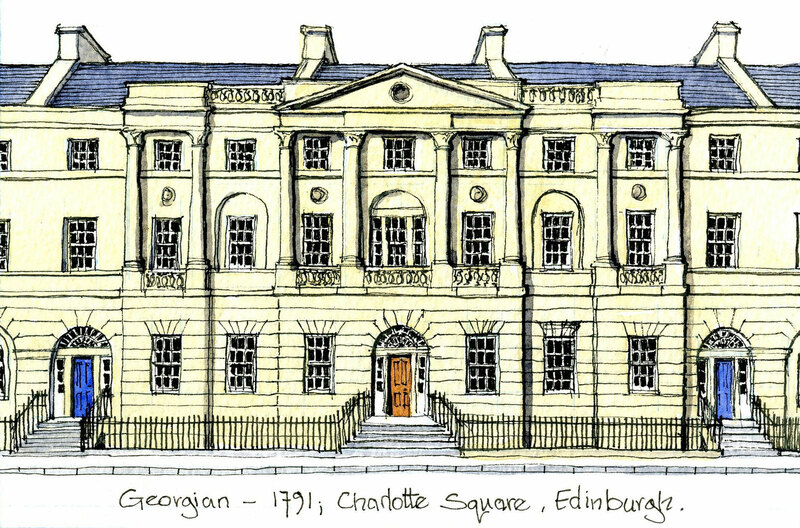 The Georgian period witnessed the construction of a series of planned grand squares and terraces, providing elegant and peaceful homes away from the noise and grime of city centres. In London Cavendish Square was laid out in 1717, followed by Grosvenor Square (1720), Berkley Square (1739) and Adam’s Fitzroy Square in 1790. Away from the capital, Bath was laid out by John Wood and his son, beginning with Queen’s Square in 1729 and culminating with the Royal Crescent in 1775. 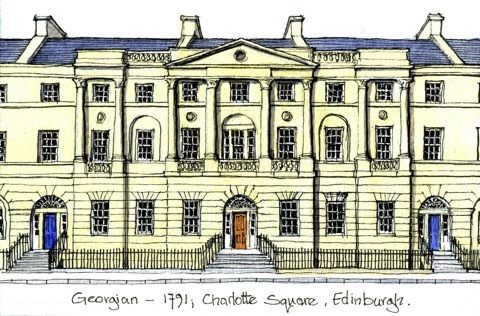 Edinburgh New Town was planned by James Craig in 1767 and was built by a variety of architects; Robert Adam designed Charlotte Square in 1791, shortly before his death. Surveyors at Tombleson Associates are not only Members of the Royal Institution of Chartered Surveyors, but also hold high academic qualifications in the field of Historic Building Conservation. We regularly survey Historic Georgian Period Buildings across the New Forest, Isle of Wight, Hampshire, West Sussex and Dorset. Dating from the late 12th century, this two storey range is all that remains of a complex of buildings that one formed the Manor House. It comprises a first floor hall and solar accessed by an external staircase set over a vaulted two chamber undercroft. 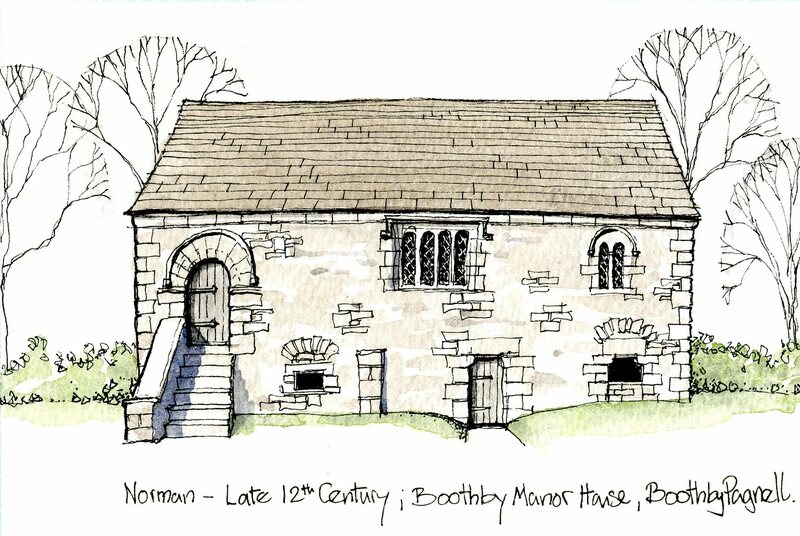 Boothby Manor House is built of coursed limestone rubble walling with a roof of Collyweston limestone flags laid to diminishing courses. Internally there is a magnificent twelfth century, round back fireplace with a massive ashlar stone hood. The four-light window to the first floor was inserted in the 16th century. 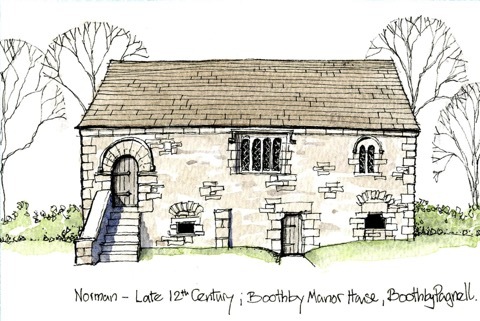 Boothby Manor House is listed Grade I. Talk To Us Today. Tombleson Associates Independent Surveyors are Historic Building Conservation experts and will be happy to discuss your issues entirely without obligation. Wealden Houses are found throughout the Kent and Sussex Weald, and occasionally beyond. They are built of timber-frame with steeply pitched hipped thatched roofs (though the thatch was later often replaced by peg tiles), with an open double height hall in the centre flanked by two-storey bays. The first floor rooms on either side of the central hall are jettied and massive oak braces are used to support the roof across the recess in front of the hall. 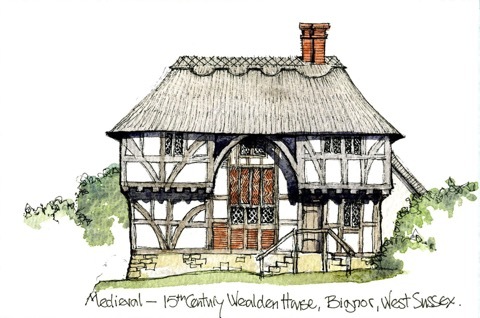 Most Wealden Houses were built for a growing class of yeoman farmers and the house type reached its peak of development and popularity in the latter part of the 15th century. This Wealden House in Bignor is listed Grade II*. 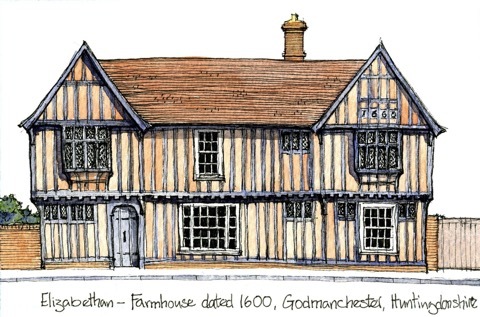 This timber-framed farmhouse has a central hall range, incorporating a cross passage, flanked by two cross wings and with a continuously jettied first floor. The close studded exposed oak framing has wattle and daub infill panels and the date 1600 incorporated into one of the gables. The roof is of clay peg tiles. The farmhouse is listed Grade II*. 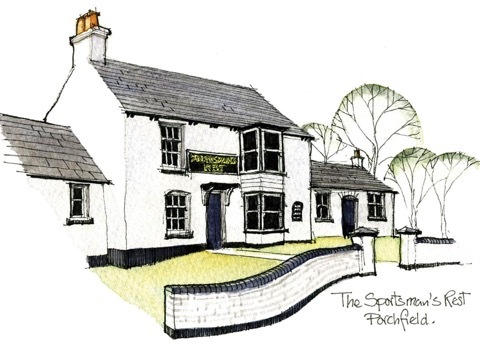 Contact Us Today and we will be happy to discuss your Historic Building matters entirely without obligation. The Romans first introduced brickmaking into England, but the skill was lost during the Dark Ages and was gradually re-introduced from the Low Countries during the late medieval period, though initially its use was confined to high status buildings and it was only in the 17th century that use of brickwork moved down the social scale. 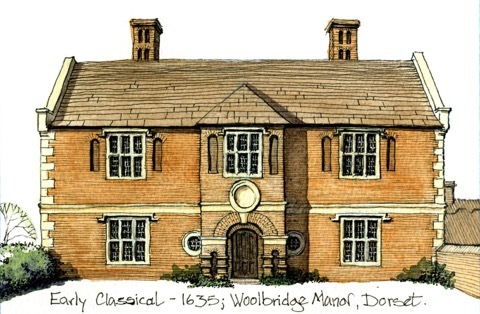 Woolbridge Manor is dated 1635 and is an example of the transition from medieval to classical design. 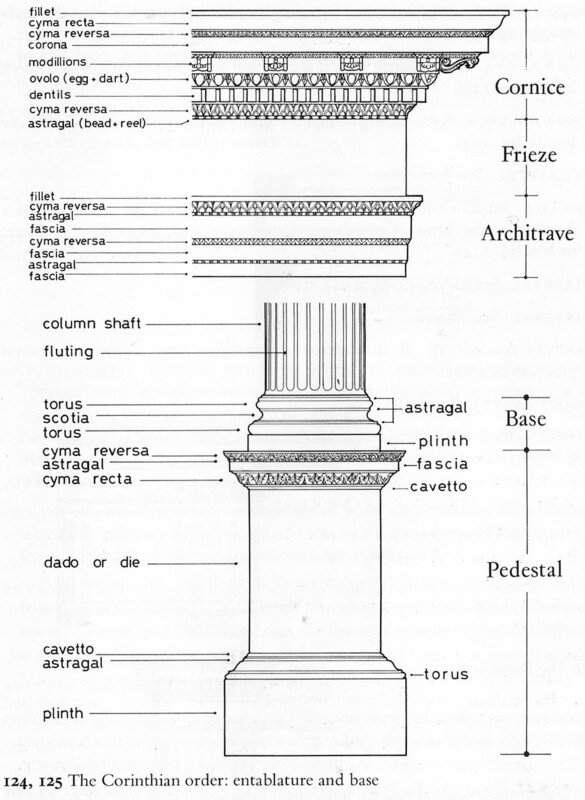 There was no understanding of proportions in these early classical buildings, and classicism was restricted to symmetry on the principal elevations and the occasional use of classical motifs, such as the circular panel on the porch. Woolbridge Manor is listed Grade II*. Expert surveyors at Tombleson Associates are not only Members of the Royal Institution of Chartered Surveyors, but also hold high academic qualifications in the field of Historic Building Conservation. We regularly examine and survey Historic Buildings like Woolbridge Manor in Dorset, Hampshire, New Forest, West Sussex and the Isle of Wight. Fully effective treatment may be impossible without causing more damage than the beetles themselves. Spraying toxins into floor voids may cause more harm to household pets than the beetle colonies and will certainly destroy the biggest woodworm predator – the spider. Under floors and in lofts etc., webs are good! Test your surveyor: does he/she know that woodworm can’t thrive with central heating in well insulated buildings? Does your Homebuyer Valuation or Building Survey admit that Death Watch Beetles have probably been in your cottage for centuries and will continue long after you have gone! More than anything, spiders will speed the decline of a beetle population in a well maintained building: by all means keep their webs out of your habitable rooms, but don’t harm them in hidden voids and lofts. Surface spray treatments are generally ineffective in the long term, so don’t let them happen! Instead, reduce dampness in timber by providing better ventilation and reducing condensation and isolating timber from dampness.